Announcements will be made via text through the emergency alert system, OBU's Facebook page, Twitter and email. The OBU switchboard operator will be informed of the decision and OBU students and personnel can call the switchboard at 275-2850 for 24-hour information regarding the University’s operating schedule. 11:00–11:50 a.m. 11:20 a.m.–12:05 p.m. NOTE: The 10 a.m. period has been absorbed into the adjusted schedule, leaving no free period or Chapel-Assembly during the inclement weather schedule. 11:00 a.m.–12:15 p.m. 11:40 a.m.–12:35 p.m.
All January Term classes will start 90 minutes later than the normal start time, and will meet for the full scheduled length of time. Evening classes (beginning at 5 p.m. or later) will start as scheduled. J-Term students are encouraged to check each course professor's Web page for additional instructions. Evening classes will meet as scheduled unless otherwise announced. 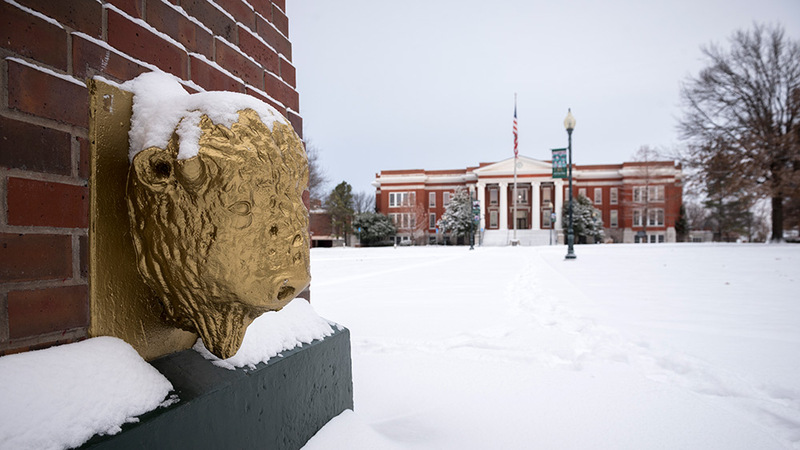 University administrative offices will open at 9:30 a.m. when OBU is following the inclement weather schedule. The offices will be informed of closing times on days when the inclement weather schedule is utilized. Student workers should contact their supervisors concerning work schedules on such days.